Our weekend was very Lilly-esque, well, in concept, not in actuality, but I'll get there - haha. What a weekend it was! Mike's sister-in-law and her boyfriend are in Charleston for the first time, so this weekend gave us the opportunity to do all of our favorite things. 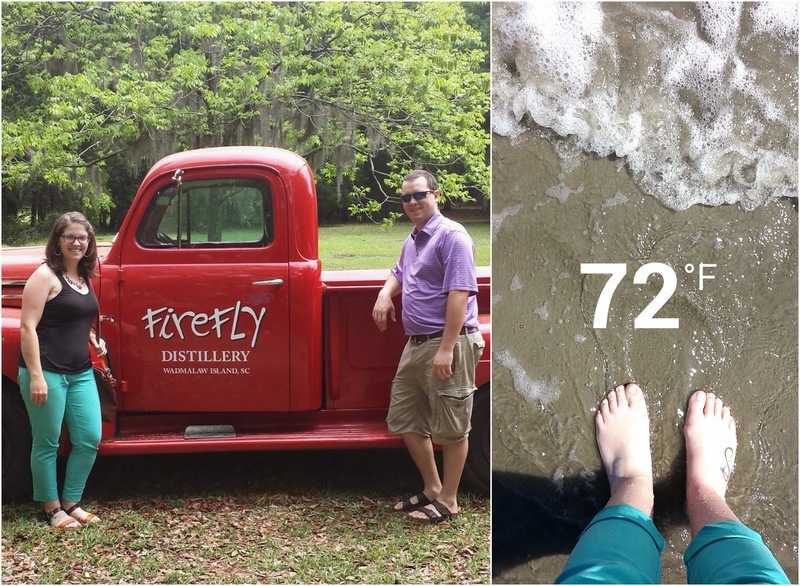 On Saturday, we did the Johns/Kiawah Island loop: Charleston Tea Plantation, Firefly Distillery, beach walk at The Sanctuary (the water is already up to 68 degrees! ), and The Ryder Cup Bar at The Ocean Course for drinks and apps. 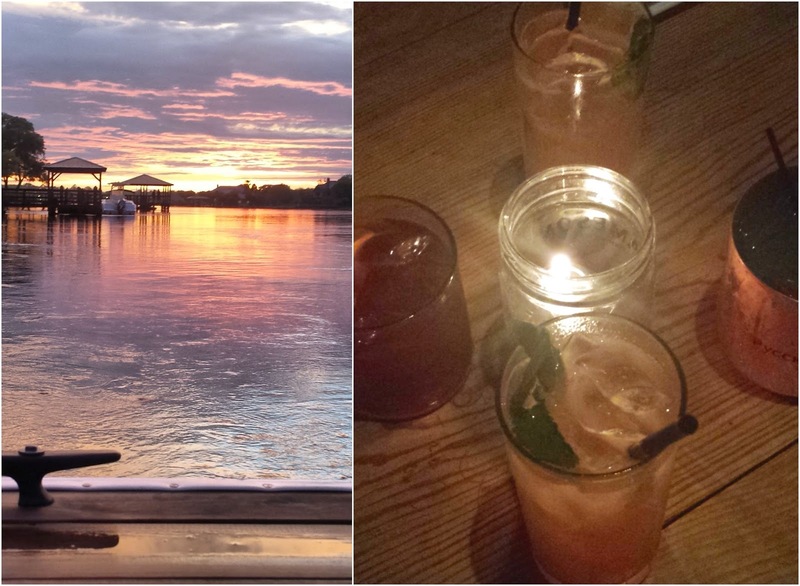 If you're ever in Charleston for a few days, I definitely suggest making this one of your days! We spent the night playing Pitch (or as Mike calls it Setback or some call it High Low Jack Game - you know the game??) and digesting delicious DeSano's. Then came Sunday. Alright, it's time for the Lilly for Target recap, pick me up after the next photos if you have no interest haha: My sister-in-law and I hopped in the car and got to Target at 7:45. After seeing the line outside the store, we laughed and came super close to just turning around and driving back home, but we decided to at least check it out and watch the craziness. I took a photo of the line and counted: there were a solid 80-100 people in front of us. I honestly couldn't believe how many people got there early, and I'd love to know how early the people at the front of the line got there. Well, we got in right at 8:00 to (obviously) empty shelves. Legit, everything was gone in 30 seconds or less. To be honest, I was pretty surprised at how small each of the collection sections were: 3 racks for women's clothes and shoes altogether, an end cap for makeup and bags, and a table at the front of the outdoor shop for the beach stuff. While I knew at 7:45 that I was never going to get anything, I was secretly still a little disappointed but that didn't last long. Erika and I had been texting since before I got to Target (she and her daughter were a different Target up the road), and at 8:00 I got a text asking if I still wanted flat sandals and what size. I didn't respond for a solid 5 minutes, trying not to get killed in the mad rush entrance, and a minute after that, I got a photo of some beautiful gold pineapple sandals (one of my 5 favorites!) in my size. Seriously, how do I have such awesome friends?? Needless to say, it was definitely not a total bust (well, my adventure was, but at least I'll get to wear some sweet sandals, soon!). I tried to see what Target had online when I came home (yeah, staying up until 2 am was not going to happen lol), but no luck, so I'll be happy with my sandals and save all that money I didn't spend for something else! Okay, welcome back to some of you - haha. Sunday, my pedometer tells me that we walked 7.4 miles. 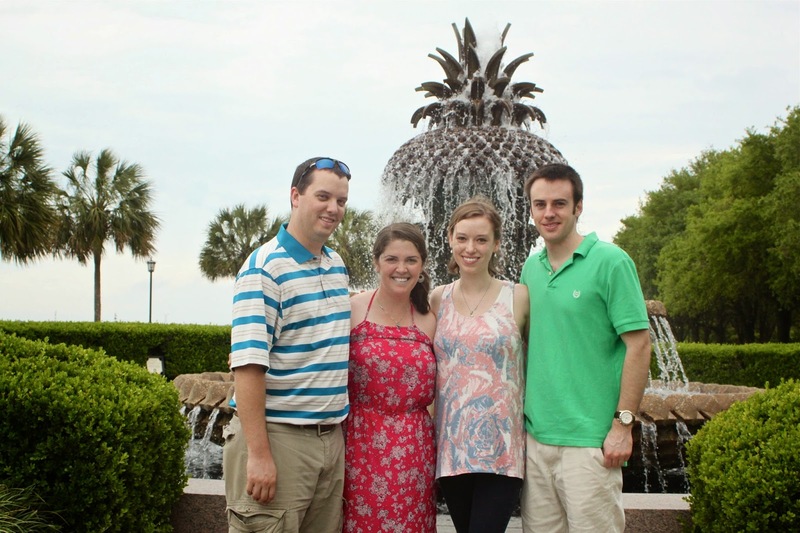 We started on Upper King, walked all the way down to the Battery with stops at the College of Charleston and along Tradd Street, up to the pineapple fountain, through the Market and back up King. Phew. We went back to the apartment, took naps (we needed them after that Target start and all that walking) and played some more cards, watching the crazy thunderstorms. Dinner was at the Charleston Crab House with drinks afterwards at Prohibition, finished off with some Jeni's ice cream. As you can tell, like with all of our guests, we definitely ate our way through the city. Now we still have two more days with Laura and Bill!! Mike's hanging out with them at the beach this morning while I work, and this afternoon, we're off to Sullivan's for some delicious Poe's and an adventure at Fort Moultrie. Then, tomorrow before work, we're heading to Magnolia Plantation (Mike and I haven't even been there yet!) and finishing off their trip at Zia - what could be better?! I envy the weather you have! I also envy those sandals. I didn't even attempt to go to Target, but I tried online and that was a fail. All I wanted was a bag and some bobby pins haha. Happy Monday! That looks like such a good weekend! Cute sandals! What a gorgeous weekend- I love when people who have never been to dc come to visit, it's so fun to show them all of your favorite places. The Lilly situation was so crazy- I was up on Saturday night when people were tweeting about certain links being live but I didn't really think it was a big deal until the next morning when everything was sold out so fast! So glad your friend got those sandals for you--- sooo cute! That looks like a wonderful weekend!!!! I wanted those sandals, and my store didn't even have them. They only had flip-flops. Oh, well. That sunset is stunning! I am glad I am not the only person who had a semi Lilly crisis! I was shocked at how nuts it was! I love the pics from the weekend. Firefly, ah, firefly. I def have to make a trip to Charleston now! What a great weekend you had! I had fun watching all the Lilly fun on twitter haha. Ummm, sounds like we do the exact same thing with out of town guests... Desano's, Jeni's, Prohibition, Poes---all the best!! FUN weekend. A for effort in trying to at least brave the Lilly crowds hah. I hate people that are already reselling everything. Might as well just buy the "other" version at Palm Avenue lol. You got your walking in for sure, girl! We have got to make it to Charleston to see all those things! It looks like a lovely place to visit! :) Enjoy your guests! How is Target dumb enough not to stock enough or restock or AT LEAST keep their website stocked? They'd make SO much more money! A crab house sounds amazing right now. Those sandals are so pretty! I can't believe the shelves got wiped out so fast. Everybody is raving about it on the blog today. What a perfect weekend! We didn't do any of the Johns/Kiawah stuff last summer when we were in Charleston and now I think I need to plan a trip back :) Glad you were able to get a pair of Lilly sandals at least! Sounds like such a fun weekend...minus the whole crazy women at Target. I sort of forgot to check my Target when I was grocery shopping at 9am yesterday...but obviously everything would have probably been gone anyways. That's pretty wild about the Lilly chaos!! Glad you got some sandals :) I need to try Jeni's, I've heard it's good! 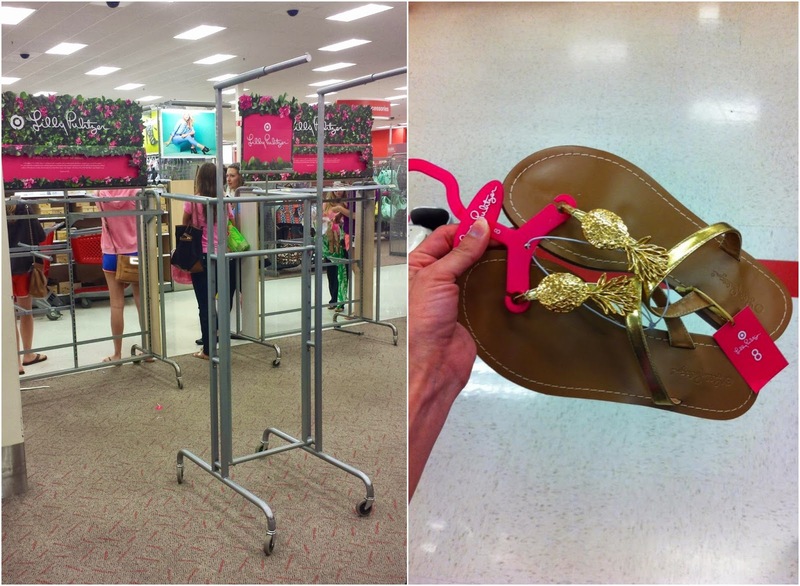 I can't believe all the craziness at Target but at least you did get some sandals. I don't get why Target has such a small selection for these collections either. These launches are worse than Black Friday! I was lucky to get a pair of the pineapple sandals and a phone case online. I just so happened to be up and heard all the buzz on Twitter about links going live. Even online shopping was a nightmare. Everything kept crashing and I got charged twice for my order! But hey, at least we got something for all the trouble! Looks like y'all had a great weekend!! Poe's sounds really good right now. I haven't been out there since the summer. Can't wait to see your pics from Magnolia!